Kaohsiung Mayor Han Kuo-yu (韓國瑜) speaking to reporters in Macau on Saturday. 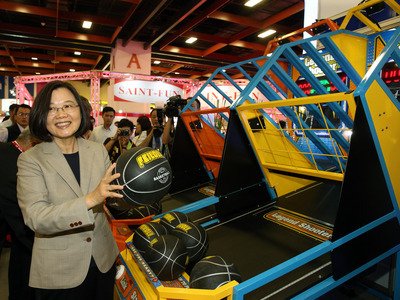 Taipei and Macau, March 23 (CNA) President Tsai Ing-wen (蔡英文) and her ruling Democratic Progressive Party (DPP) on Saturday slammed Kaohsiung Mayor Han Kuo-yu (韓國瑜) for his meeting with Beijing's top official in Hong Kong, warning it could be used by China to promote its "one country, two systems" formula for unification with Taiwan. Tsai, who is currently in Palau on state visit, said it would be hard to rule out that Beijing was trying to create a "one country, two systems" atmosphere. That is because the Liaison Office of the Central People's Government in the Hong Kong Special Administrative Region (LOCPG HK) is an institution that symbolizes the imposition of China's "one country, two systems" in Hong Kong, Tsai said. The Kaohsiung mayor, who arrived in Hong Kong on Friday morning on the first leg of a seven-day tour that will also take him to Macau, Shenzhen and Xiamen, was invited to the liaison office by LOCPG HK Director Wang Zhimin (王志民) for a dinner reception. Han, who was the first Taiwanese mayor to have visited the building in Hong Kong, did not respond directly to the criticism, but said, according to the Apple Daily, that he and Wang had a pleasant conversation and did not touch on sensitive issues. He said they spoke on topics related to family, work and the futures of Hong Kong and Kaohsiung. Aside from Tsai, other DPP members criticized the Kaohsiung mayor, who would be the opposition Kuomintang's most popular presidential candidate should he decide to run in 2020, according to recent opinion polls. Secretary-General Lo Wen-jia (羅文嘉) criticized the Kaohsiung mayor on his Facebook page, saying that while Han said his trip was to promote trade, he did not hesitate to meet with Wang at the liaison office immediately after a reception with Hong Kong Chief Executive Carrie Lam (林鄭月娥). Anyone who searches LOCPG HK on Wikipedia will know that the institution is an organ of the Central People's Government and one that acts like an emperor over Hong Kong, Lo said. Every pro-democracy activist in Hong Kong knows that the liaison office is the "devil" from China, he said, and questioned why Han would even venture into the building not knowing what it symbolizes. In the eyes of the Communist Party, the "one country, two systems" formula means Beijing will always have the final say, whether you are pro-People's Republic of China or pro-Republic of China on Taiwan, Lo warned. Several pro-democracy activists in Hong Kong, notably Nathan Law (羅冠聰), also took issue with Han's visit with Wang, describing the meeting as "devil's trade" and that it revealed China was using its "sharp power" to infiltrate Taiwan. Joshua Wong Chi-fung (黃之鋒), a Hong Kong student activist and politician who serves as secretary-general of pro-democracy party Demosistō, cautioned Han not to buy into the so-called "one country, two systems" and instead help preserve Taiwan's democracy and freedom. Taiwan's Mainland Affairs Council (MAC), meanwhile, called on Han to provide information on his discussions with Chinese officials there and remain open about his itinerary. MAC spokesperson Chiu Chui-cheng (邱垂正) told CNA on Saturday that there are currently no rules forbidding city mayors or county chiefs from meeting with Chinese officials in Hong Kong or Macau, unless it involves the signing of a policy agreement, which only the central government is authorized to do. "We hope the Kaohsiung City government will uphold the principle of equal dignity when interacting with officials there," he said. In response, Han told reporters after arriving in Macau on Saturday that there was no way he would sell out Kaohsiung under the watchful eyes of his wife, the deputy mayor, and 10 other city councilors who are all accompanying him on the trip. The trip is about selling fruit and vegetables, Han said, describing the MAC's remarks as sour grapes. Speaking of his meeting with Macau Chief Executive Fernando Chui Sai On (崔世安), Han said they talked mostly about business opportunities for Taiwanese agricultural products. He also said they discussed opening direct flights between Kaohsiung and Macau only to realize later that direct flights already exist between the two destinations. He apologized for the mistake. While there, Han secured deals for the export of agricultural and fishery products to Macau. According to the Kaohsiung City government, a total of NT$730 million (US$23.6 million) in trade deals for Kaohsiung products were signed Saturday, consisting of 27 separate deals. His visits to Hong Kong and Macau have brought a combined total of NT$3.4 billion in deals for Kaohsiung, city authorities said. According to Hong Kong media reports, the Kaohsiung mayor also met with Macau Liaison Office Director Fu Ziying (傅自應) during the day, and they later attended a dinner reception together at a local hotel restaurant known for hosting official high-level Chinese delegations. The liaison office, officially known as the Central People's Government Liaison Office of the Macao Special Administrative Region, is China's representative office in Macau.